The Russian fertilizer oligarch Andrei Guriev (lead image) lives in less than seclusion in London in the largest house of that city except for the Queen’s residence at Buckingham Palace. In 2015 the running costs of Guriev’s establishment were large but stable. But it occurred to him that the prospects of war between Russia and the US were so serious, he ought to take more cash out of his London-listed Russian phosphate producer Phosagro, which had been running at a loss the year before. So Guriev arranged for a dividend payout of 80% of the 2015 profit of Rb36.4 billion – that was Rb29 billion (about $470 million). The percentage grab was a Russian oligarch record. Guriev runs a family business. He is deputy chairman of the 8-man board; his son Andrei Junior is chief executive; his wife Yevgenia Gurieva holds a 4.82% shareholding in her own name; and through Cyprus companies the Gurievs own another 45.5%. Or they did until recently, when Guriev arranged the sale of 4.5% of his shares for the purpose, he declared to the stock market, of buying 2.7% from another shareholder. Noone in Russia or the London market knows why Guriev did such a thing, or why it made commercial sense to do so – unless Guriev was doing what a market source says he has always done. “Maybe he’s the trustee and nominee shareholder for someone else, and selling for that shareholder, not for himself.” Guriev’s supporters in the market claim the deal was intended to improve the liquidity and share value of the company. But the result was the opposite — in the time Guriev took for his back-to-back deal between January and March, the Phosagro share price fell 15%. 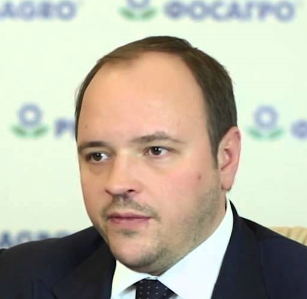 The minor shareholders of Phosagro are Vladimir Litvinenko (below, left), a one-time instructor in mining economics at the St. Petersburg Mining Institute for Vladimir Putin; Litvinenko holds 14.54% of Phosagro. Igor Antoshin (centre) was, like Putin, a student of Litvinenko’s. He was also a veteran of Phosagro when Mikhail Khodorkovsky (right) and his associates controlled it; Antoshin’s stake was until recently 14.58%. But the daily volume of Phosgro shares traded out of the 389 million on issue has been small – usually less than 1 million, except for one day, May 31, 2016, when 15 million shares were bought and sold for no reason that was visible in the market, or in the company’s announcements at the time. As a consequence of Phosagro’s lack of transparency, the market doesn’t think much of the company compared to its international fertilizer peers, and has substantially discounted the share price. 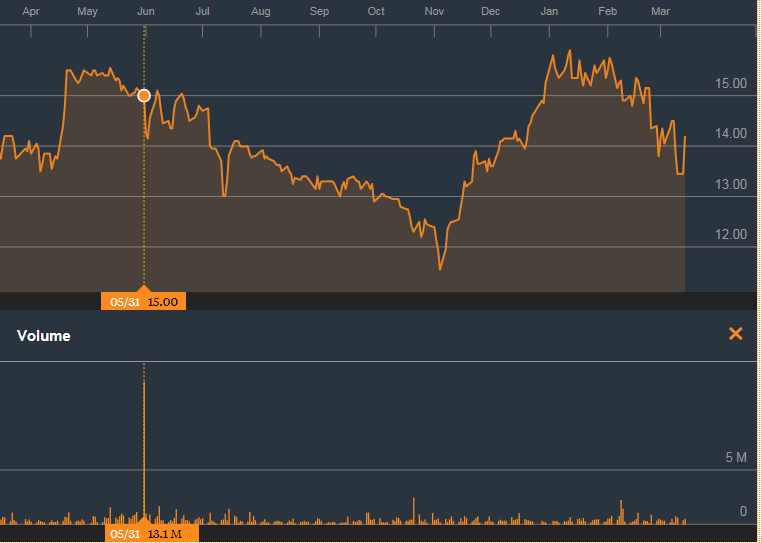 Market pricing of Phosagro shares is at a ratio of 7.3 price to earnings (P/E). The P/E ratios of US, Canadian, German, Norwegian and Israeli fertilizer rivals in the marketplace show they are several P/E magnitudes more trusted to manage their business, account for their trading revenues, and share their profit equitably. The untold story of Guriev’s family business starts with how Guriev obtained it from Mikhail Khodorkovsky and Platon Lebedev, while the duo were in jail on convictions for having stolen their shares and assets from the state. Read more here. More recently, a Limassol court prosecution by Alexander Gorbachev, a former Phosagro chairman with a 24% stake, has charged Guriev with stealing Gorbachev’s shareholding in the company. Their history together can be followed here, along with Guriev’s and Phosagro’s disclaimers. So far there has been no adjudication in the two-year old, stop-go case. According to a Cyprus legal source this week, the Gorbachev proceedings have been suspended again, possibly for good. The Guriev shareholding in Phosagro has been so murky, and Guriev suspected of being the front-man for concealed stakeholders, that his share dealings have attracted questions he himself has never publicly addressed – is he the only beneficial owner of the Cyprus companies which hold his purported stakes? Are those he represents planning to sell out of Phosagro? If so, can Guriev afford to buy their shares and avoid loss of his own control? By Russian business standards, Guriev has been having a lucrative war. The collapse of the rouble in November 2014 cut Phosagro’s production costs and widened the profit margin between costs of production priced in roubles and sales of phosphate rock and fertilizers priced in US dollars. Most of Phosagro’s shipments of phosphate rock go to Russian buyers; most of its shipments of diammonium phosphate (DAP), urea, and other fertilizers are sold abroad through Phosagro subsidiaries registered in Cyprus; Zug, Switzerland; and Singapore. 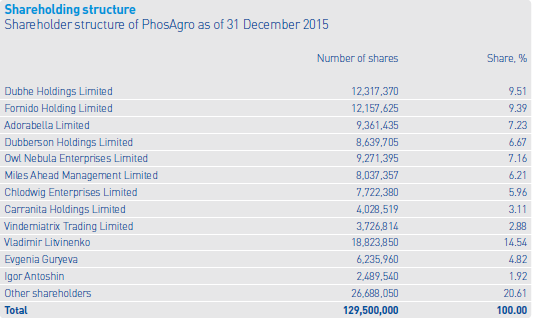 Phosphate product sales comprise almost 90% of Phosagro’s revenues. Of this aggregate, phosphate rock represents 12% of sales; phosphate-ammonium fertilizers, 44%; phosphate combinations with potash and sulphur, 27%; and monocalcium phosphate (superphosphate), 5%. When the rouble strengthened last year, the dollar value of the company’s results began to shrink. Total revenue for the last reported period, nine months to September 2016, was Rb147.6 billion ($2.2 billion); for the comparable period of 2015 revenues were less in roubles, but more in dollars — Rb142.3 billion, $2.4 billion. Earnings likewise fell from $1.1 billion to $862 million, and the earnings margin from 44% to 40%. Net profit grew from $532 million to $710 million. While sanctions struck at the trade and capital flows of most major companies in the Russian economy, Guriev’s sales to Europe in 2015 jumped by 84% over the year before. Source: https://www.phosagro.com/investors/ -- Annual Report for 2015, page 35. Source: https://www.phosagro.com/investors/ -- December 2016 presentation, page 32. Source: https://www.phosagro.com/investors/ -- December 2016 presentation, page 34. The market vote of lack of confidence in Guriev, compared to Phosagro’s peers, can be viewed here. It hasn’t improved market sentiment that Guriev has been paying out much more than his peers in shareholder dividends because it is understood he is trousering the cash for himself. Source: https://www.phosagro.com/investors/ -- December 2016 presentation, page 33. A month ago, Phosagro announced that 4.5% of its shares had been sold in a secondary public offering. The sale was described as needed to raise funds for a follow-on purchase of 2.7%. $252 million was raised by Guriev from the 4.5% sale; $147.5 million was then spent on the 2.7% purchase. This was announced on February 21, when the company confirmed Antoshin had sold part of his shareholding to Guriev. 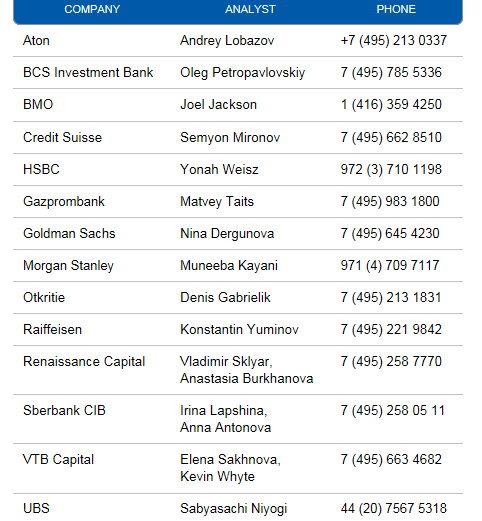 From the transaction sequence Guriev appears to have pocketed $104.5 million; Antoshin $147.5 million. Control of the company, however, remains unchanged. So why sell more to buy less? This is a question Phosagro’s management and board have not explained. 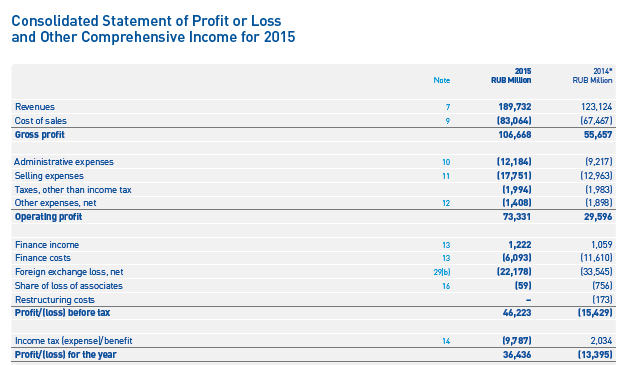 Source: https://www.phosagro.com/investors/ -- Annual Report for 2015, page 132. “Based on information available to the Company the shares of Fornido Holding Limited, Dubhe Holdings Limited, Chlodwig Enterprises Limited, Adorabella Limited, Miles Ahead Management Limited and Owl Nebula Enterprises Limited are ultimately held on trust where the economic beneficiaries are Mr. Andrey Guryev and members of his family.” Bottom line, Guriev controlled 50.28%. Antoshin likes to keep his cake wrapped. He reported his shareholding this way at the start of 2016: “Mr Antoshin owns shares equivalent to 1.92% of the Company’s authorised capital. Based on information available to the Company, Mr Antoshin holds the right to indirectly control 100% of the voting shares of Vindemiatrix Trading Limited, Carranita Holdings Limited and Dubberson Holdings Limited, which together hold shares equivalent to 12.66% of PhosAgro’s authorised capital.” In other words, 14.58%. From this sum last month Antoshin sold Guriev 2.7% and left himself 11.88%. The February 21 company report also says that just two Cyprus companies representing the Guriev family – Adorabella and Chlodwig – now remain with 43.66%; together with Mrs Gurieva’s stake, this makes the Guriev total 48.48%. What had happened to Guriev’s Cyprus holding companies recorded a year earlier – Dubhe, Fornido, Owl Nebula and Miles Ahead? Together, they had owned 32.27%, while Adorabella and Chlodwig had just 13.19%. Officially, according to the company’s reports to the market over 2016, the Guriev family continued to control almost the same-sized stake in the company. So why did the Guriev family sell out of the four Cyprus front companies and into the two, and when? Did the sale happen to coincide with the record-volume sale day of May 31, 2016? On that day, according to the Bloomberg chart, 13.1 million shares (3.4% of the issue total) traded at $15 apiece — $197 million in total value. Does the evidence suggest that Guriev was fronting for others, who decided to sell and obliged Guriev to buy them out at a premium, before the share price collapsed? The financial reports for Phosagro reveal that the shareholding switch or sell-off in 2016 came after a bumper year in 2015, and the promise of even better results. 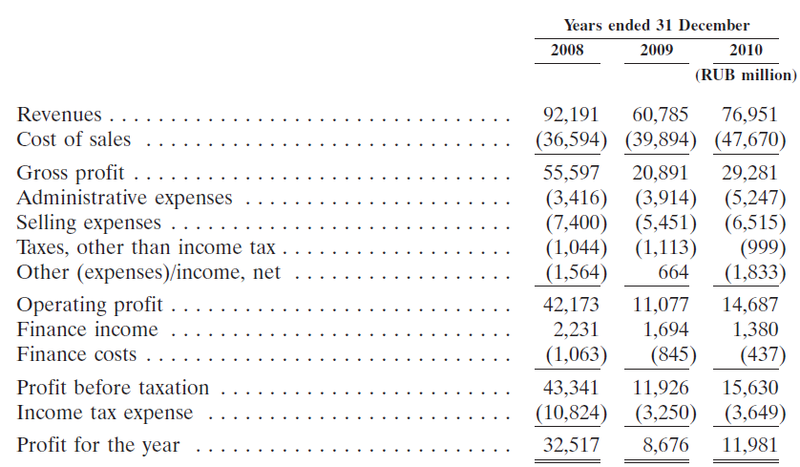 All financial reports can be found here: https://www.phosagro.com/investors/reports/msfo/ Individual financial reports in pdf format do not have individual website links. The financial report issued in mid-November for the nine months to September 30, 2016 – the latest disclosure from Phosagro – shows that revenues rose modestly by 5.3% to Rb147.6 billion. Costs grew, and so did tax paid. 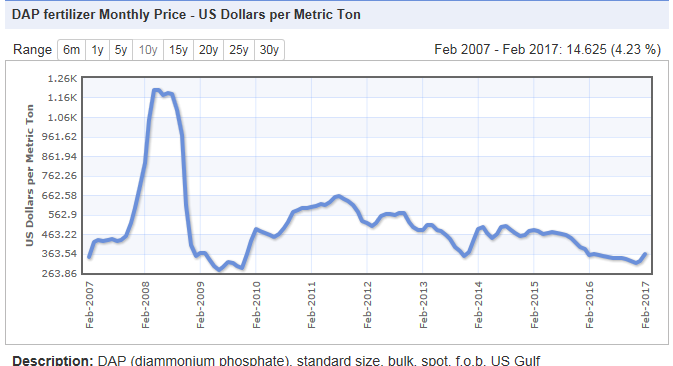 But the cheap rouble and higher phosphate price lifted bottom-line profit to R48.5 billion – that’s a jump of 54%. 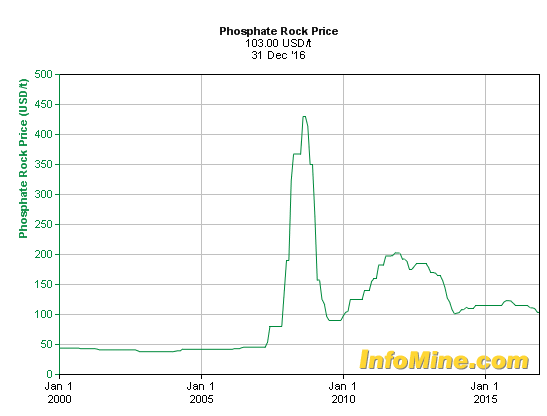 So in theory, Phosagro’s best years ought to have been 2008, when the prices of phosphate rock and DAP were rocketing upwards; and also in 2012, when fertilizer demand began to recover from the crop trade bust of 2009. Phosagro didn’t publicly list its shares on the London Stock Exchange until July 2011. Click here to read the prospectus prepared by underwriters Citi, Raffeisen, Renaissance Capital, BMO, Credit Suisse, and Troika Dialog. Read the analysis of what Guriev was really doing here and here. 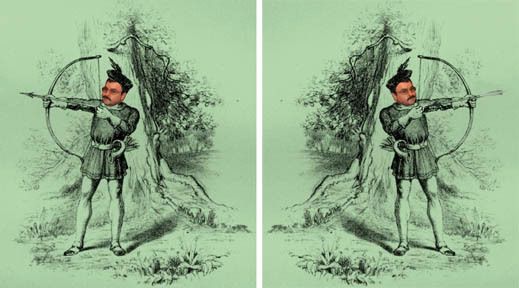 The Initial Public Offering (IPO) document confirms the theory of Phosagro’s boom and bust. The subsequent Phosagro report for 2012 reveals that profit recovered to Rb24.5 billion (amounting that year to $787 million). But looking back in retrospect, the second and third war years, 2015 and 2016, have produced the largest rouble profits Phosagro has ever seen. So, again, what explains Guriev’s move to sell 4.5% of his shares and buy 2.7%? One explanation given by analysts in London is that the dealing has lifted Phosagro stock’s liquidity and promised to lift its share price. The free float, for example, was reported by the company at 20.6% at the start of 2016; by last month it had expanded to 25.1%. The difference of 4.5% appears to include the shares Guriev sold in February, so there are now more public shareholders of the company, and Guriev has taken over some of Antoshin’s stake. Each of the analysts was asked this week how to explain the sale of 4.5% and the buy-back of 2.7%? Not one of them was able or willing to answer the question.